Charlotte was extra feisty on Sunday morning when I was putting her outfit on, so I knew it was the perfect day to take her to the farm! She’s been working on all kinds of new sounds and I’m certain she was trying to explain her excitement about all the fun pumpkin-y things that awaited her. Bates Nut Farm was pretty fantastically festive. I love these kinds of places. It reminded me a lot of Gull Meadow Farms in Michigan, but on a smaller scale. I think the only thing that would have made the experience better was if it were 60 degrees, not 80 degrees. 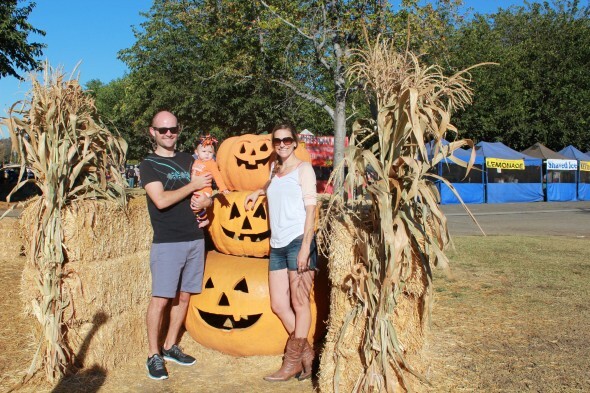 Charlotte had a blast with all the pumpkins, too! I don’t know who is more excited to go back next year- Matt or Charlotte?? We’ll definitely be going earlier in the season… perhaps even in September! Ain’t no junk in that trunk, girl! The outfit kills me!!! Oh my gosh what a cutie!!! Looks like fun! We’ll have to join you next year!